How do some orchids mimic insects? Could you please tell me how some orchids can replicate a female bee scent, and visually, to attract a male bee? Does this mean plants can see? ps I've downloaded a 100 plus of your podcasts and enjoy listening to them when i'm driving my lorry through the night. 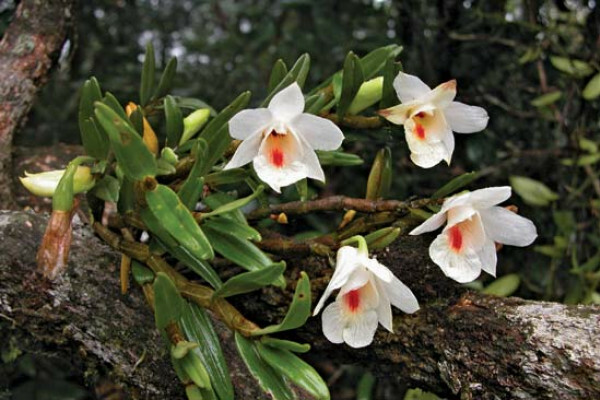 There was a wonderful paper written by a lady called Jennifer Brodmann, who is a researcher at the University of Ulm, and she was on the Chinese island of Hainan looking at an orchid called Dendrobium sinense. Now, this is a really interesting orchid because no one knew what pollinated it. It makes these beautiful flowers. It's a white flower with a red centre, but it's "rewardless". In other words, the flower doesn't give anybody anything if they come and visit it. So she decided to do a stakeout and she watched this flower - 121 hours of footage - to see what came by. And 35 insects paid a visit, of which the majority - over 30 - were a kind of hornet. And she thought, "That's interesting." A closer inspection revealed that these hornets didn't come in and spend much time loitering there. They flew in and pounced on the flower and then abruptly left. But when they looked more closely, they saw that, as the hornet was doing the pouncing, it was actually depositing a bit of pollen on the orchid, fertilising it, and also picking up some pollen to take to another flower. So they thought, "There must be something which is attracting this hornet to this flower." So they made extracts of all the chemicals that come out of the flower and they found one really interesting one. It's eicosen-1-ol. And this particular molecule is a pheromone made by bees. And, in fact, it's an alarm pheromone that bees make when they want to tell other bees about something exciting going on. What they realised is that this hornet species eats bees, and it feeds the bees to its young hornet larvae. So what the orchid is doing is making itself smell like a bee to attract a hornet, to get itself fertilised. And it's doing it by making the same chemicals that the bees would and, thereby, fooling the hornet, so a wonderful example of sexual kind of subversion going on. The point is that the plant has evolved to have the same genetic pathway, or the same synthetic pathway, that can produce these chemicals because this is the way in which it gets itself pollinated, and very effectively too by the look of it. If you want to read it, it was actually published in Current Biology, last year, Jennifer Brodmann, a wonderful bit of science. Previous Why do some batteries last longer than others? Next Have there been conjoined twins in the past? Can we use virtual worlds to study crowds? Why are bees important to plants? Just saying through random genetic mutation that these and many flowers have designed themselves like this isnt satisfying enough, so hyperthetically if a plant had "genetically mutated" itself over many years to have human female organs because it found that pollination through human Transferal was the most effective way to polliate this could happen, obviouslly it sounds funny me saying that but that is basically the answer ever single website has been able to come up with and I do not find that as a satisfying answer. The answer above doesn't actually 'answer' the question. I too thought "man... these plants must somehow be able to "See" if they are producing a flower that resembles an insect! How does it 'know'?!? !